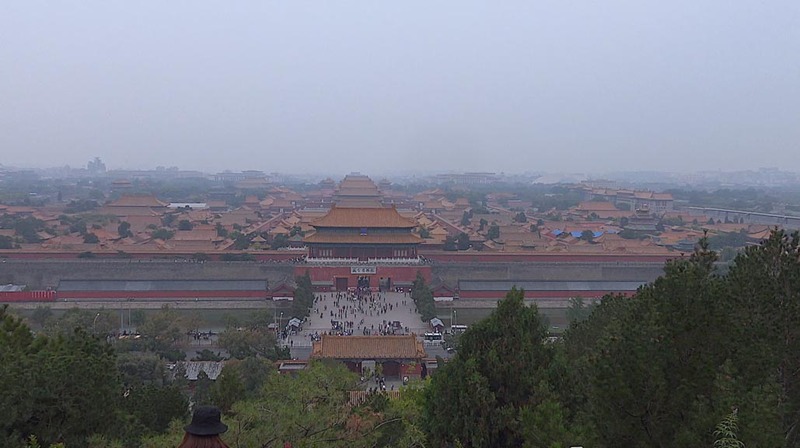 Before traveling to China, I never fully understood why it was called the Forbidden City. But when on a tour in Beijing, I learned all about its fascinating history. won a bunch of Academy Awards and was based in the Forbidden City. I had also heard that there was once a Starbucks right in the middle of it all. 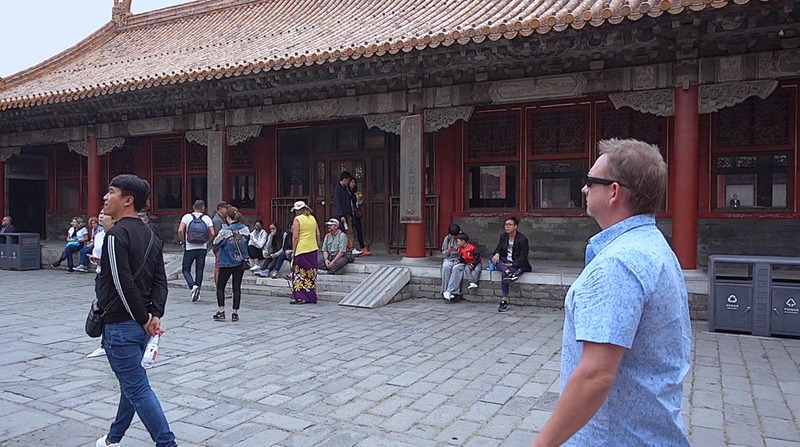 While there isn't a Starbucks there anymore, I now understand more of the history behind this famous site in China's capital city and why it is indeed called The Forbidden City. 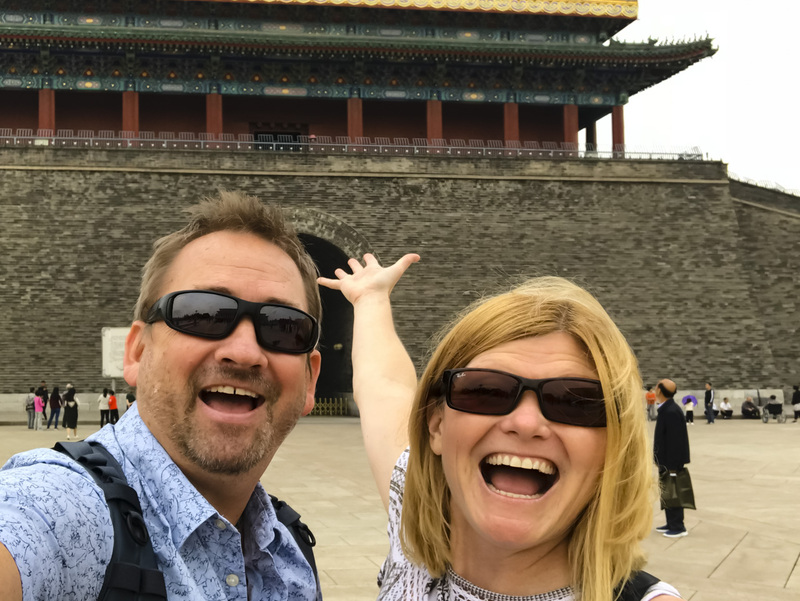 Get Your Guide offers advance tickets to the Forbidden City and a Full Day tour of Forbidden City, Tiananmen Square with lunch. 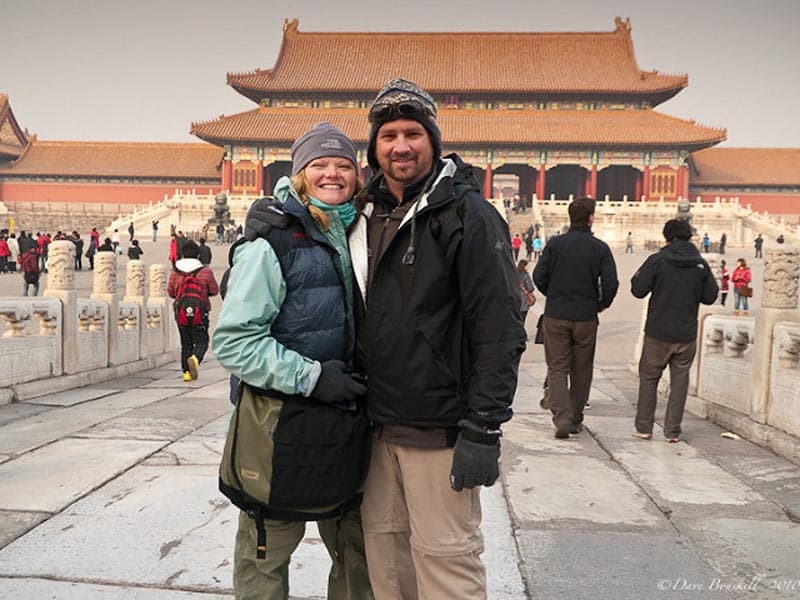 We have visited the Forbidden City twice in our travels and the second time was far more interesting than the first. In the beginnig, I spent my time trying to wrap my head around the history, but when I arrived a second time, I took it all in and could truly appreciate the significance of the palace. Both of our visits to Beijing happened later in the year. Our first trip took us there in the winter, December 2010. Our second trip happened in September/October 2018. We were lucky to have clear days on bothoccasionss. If you are going to visit Beijing, avoid the summer months and opt for clearer days in the Autumn or Winter. 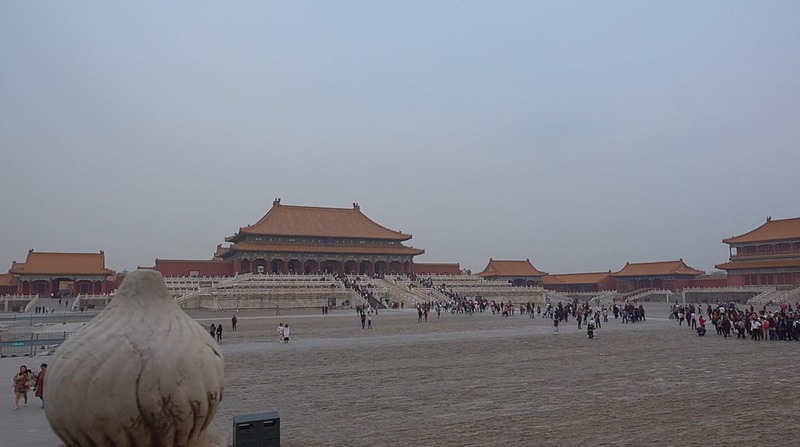 We had many a blue sky during our visit of the Forbidden City in winter. September was a mix of sun and clouds, with a lot of clear days too! The Forbidden City is the number one attraction in Beijing and it is busy. But in the cooler months, there are far less crowds. There is a lot to get through when touring the Forbidden City. We suggest at least a half a day. 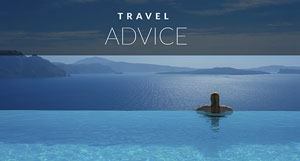 Be prepared for a lot of walking and your guide will be giving you a lot of information. So I suggest doing your research before you go to understand what your guide is talking about. When you enter, the first thing you'll see is a massive square. It is the outer building of the Forbidden City. The Emperor and his followers rarely made an appearance in this part of the city. It was for formal gatherings and military exercises. It is tempting to stop to take photographs of this area, and while your guide might not like it, we suggest making the time. We felt this was the most impressive part of the entire complex. But while we're here, let me tell you a little bit about what I learned during the 4-hour tour. Built in the 1400's during the Ming Dynasty, the Forbidden City housed the ruling Emperors and their households for 500 years. It has a whopping 980 buildings and over 8000 rooms. 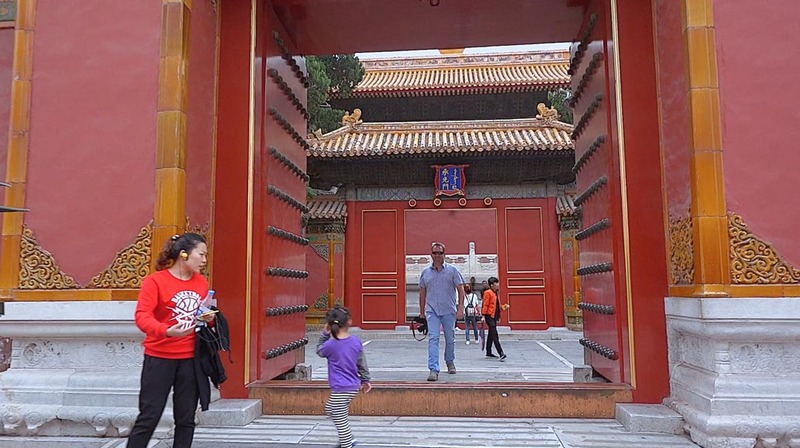 Commoners were not allowed in the city and many of the Forbidden City's inhabitants were not allowed to leave. The only people living with the inner walls of the city were the Emperor, his Empress, his concubines and his guards that were castrated men known as Eunuchs. Even male relatives of the Emperor were not allowed to stay over night in the inner circle of the city. Eunuchs guarded the concubines. Castrated men were the only other people that lived in the palace and allowed into the inner courtyards of the Forbidden City. This was to ensure that the Empress and the concubines could not be impregnated by anyone other than the Emperor. Eunuchs lived a privileged life gaining power in politics and wealth. They just had to do without he hem…the other stuff that goes along with being a man. By the time of the Qing Dynasty (China's final dynasty) there were 20,000 concubines on the premises. Some never even met or saw the Emperor, but were kept in the city until the end of their days. Other's who were in favour with the Emperor lived a rich life and had enough wealth to spread to their extended families. The competition was fierce to be in good favour though and many times lead to murder. It was a cutthroat and lonely life for the concubines. They were allowed only once a year to look out from behind the walls and see their families and friends. No commoner every saw the Emperor. If they tried to enter the city without his permission, they died a slow and painful death. And so, in the middle of this giant city stood an impenetrable wall surrounding a lavish lifestyle. 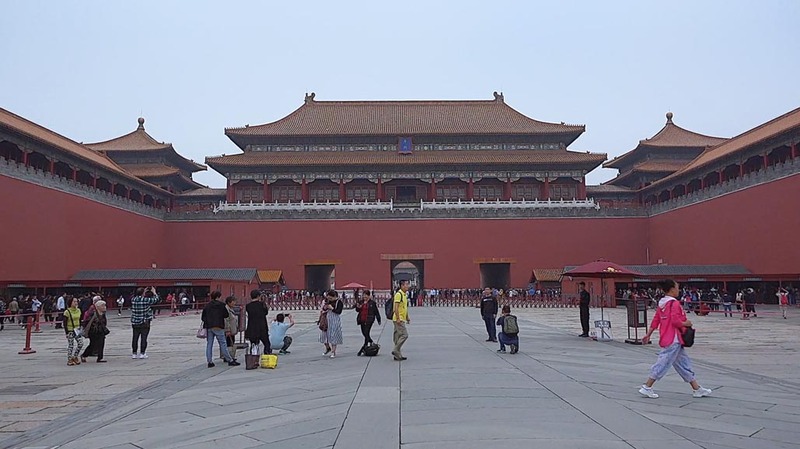 Like many of the landmarks in China, The Forbidden City took one million men working tirelessly in dismal conditions over 15 years to make a massive self-indulgent monument for the Emperor. Unlike the Terracotta Warriors, I didn't find any record of the artists being murdered after their work was complete. 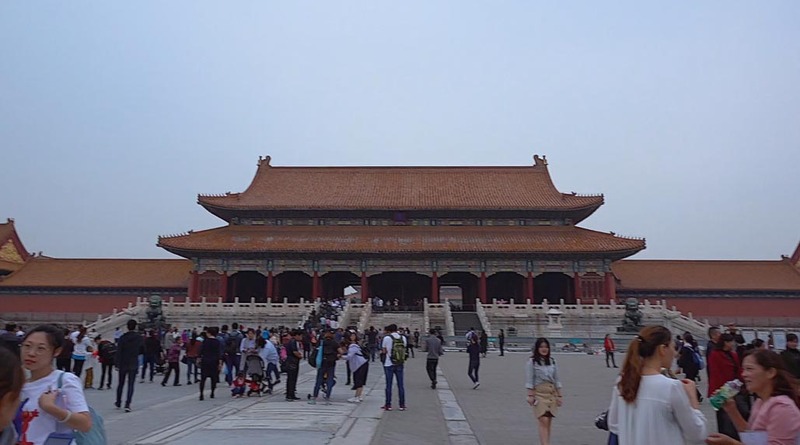 The Forbidden City is divided into many sections, but there are two main areas that divide the complex, The Outer Court and the Inner Court. The outer court was used for ceremonial purposes and meetings and the inner court was the residence of the Emperor and the rest of the gang. There are buildings with names like The Hall of Heavenly Purity, The Palace of Earthly Tranquility and The Hall of Supreme Harmony. These names made me chuckle since there wasn't a lot of harmony or tranquility during the time of these dynasties. The artistry and work that went into the palace cannot be denied though and the Forbidden City is beautiful and certainly worth seeing. There is one work of art that is extremely impressive. 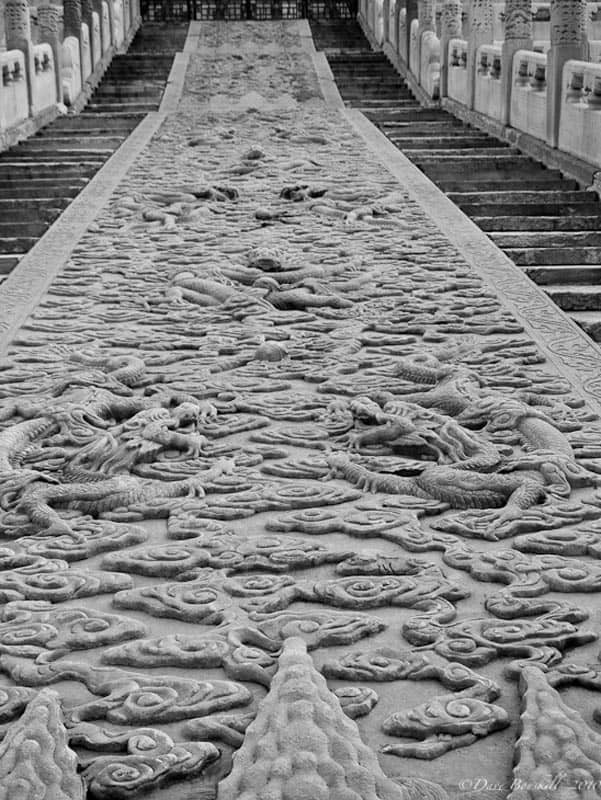 A solid 16.5-metre long marble slab weighing in at 250 tons can be found behind the hall of preserved harmony. It leads up the steps towards the rear entrance carved with dragons weaving their way towards the door. It was moved 70 km from its place of carving. How does one move something so heavy at that time? They formed an ice highway to slide the slab all the way to Beijing. Waiting for winter to arrive, water was poured in front of the slab to freeze as 20,000 men and 20,000 horses pulled the slab to its final destination. We walked through some more walls and looked at some more buildings until we finally came to the end of the road. The last portion of the tour took us to the Imperial Gardens. That just sounds too cool to say that we have been to the Imperial Gardens. 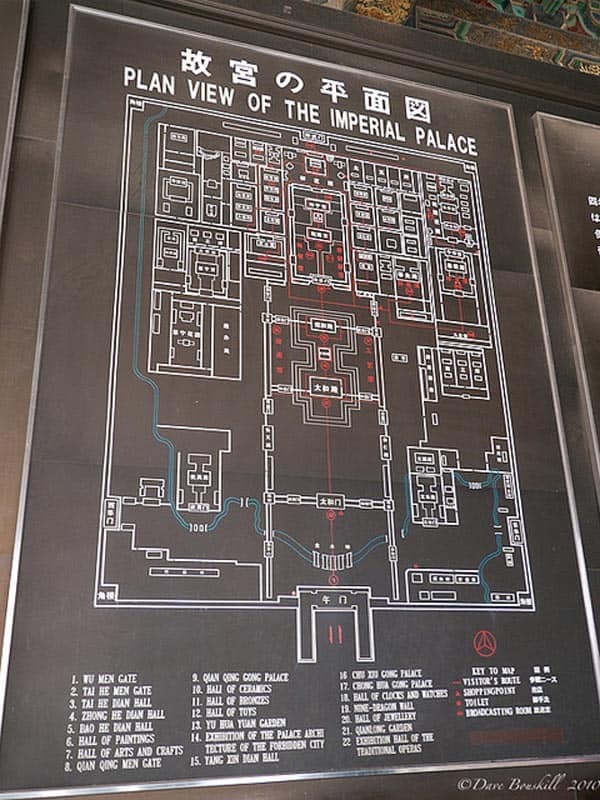 This was probably one of our favourite parts of the palace. The gardens were filled with rock sculptures and gardens. The most impressive is the Hill of Accumulated Elegance, or The Dui Xiu Shan. 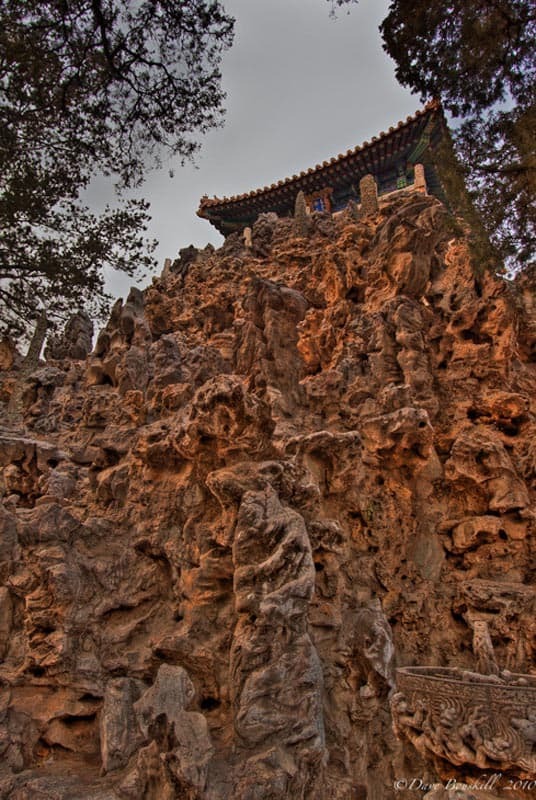 It's a high rock mountain where the Emperor and his concubines would climb every ninth day of the ninth lunar month. 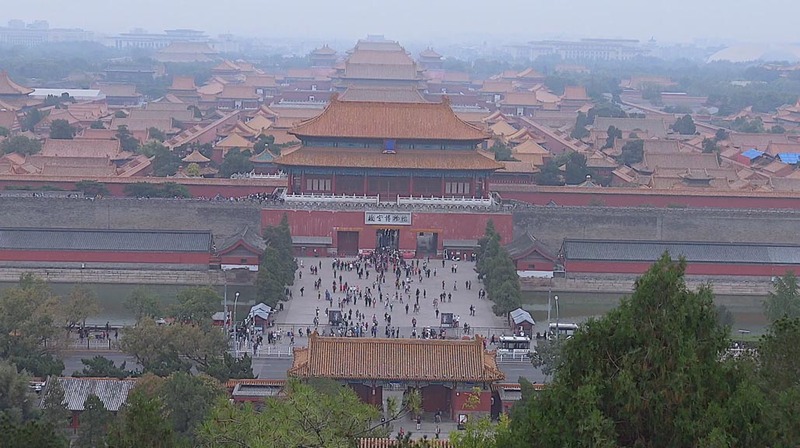 Make sure to walk up the Hill for an overview of the Forbidden City. We missed this on our first tour of Beijing, but it was definitely worth it the second time around. It shows just how massive the complex is. 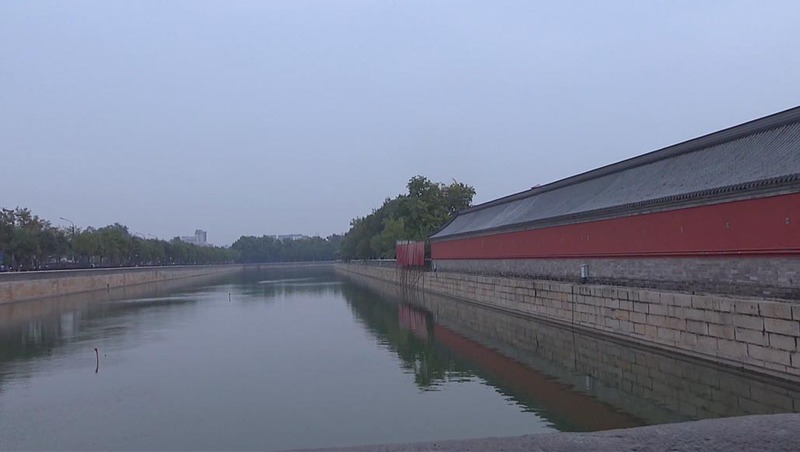 It offers views of Beijing and the Forbidden City including the moat surrounding the complex. Fun Fact: The Most is 52 metres wide because that is as far as an arrow could shoot, so even sharp shooters could not penetrate the outerwalls. Under different circumstances, this palace could have been a place of great serenity and beauty. But at the time it was a prison for everyone. It was a prison for the concubines, a prison for the Eunuchs that were sacrificed at a young age by their parents and even a prison for the Emperor who was under the constant threat of assassination. People may have been forbidden to enter, but its residents were also doomed to never leave. There are many neighborhoods to stay in Beijing. 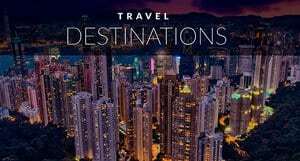 But the three main that we recommend are near the Hutongs; Shichahai Sandalwood Hotel is an authentic hotel set in a former palace. It is walking distance (3 1/2 km) to the Forbidden City. 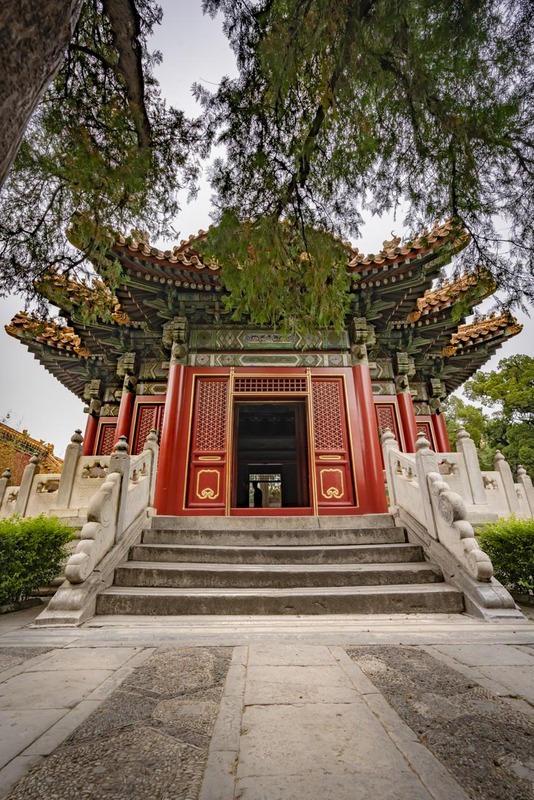 Near the Forbidden City is an excellent choice for neighborhoods to be near the sites and plenty of dining options. There is a nice hotel we stayed at on the edge of town and close to the airport. Other tour groups stayed here as well. 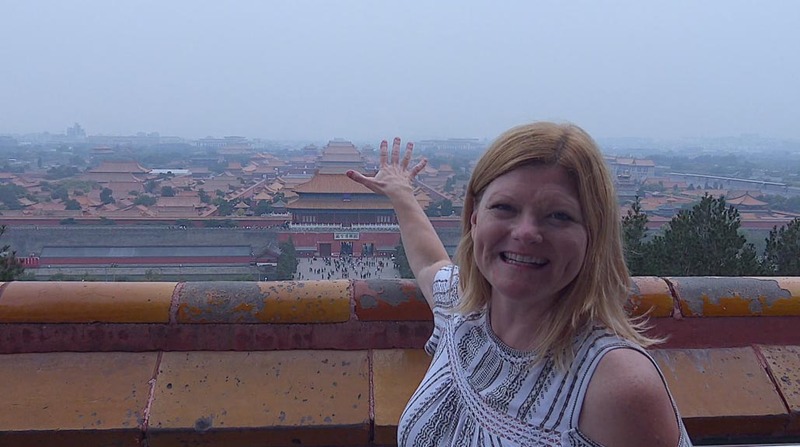 21 Responses to "Forbidden City Beijing – All You Need to Know Before You Go"
It looks simply wow..Can’t even explain the city in words!! 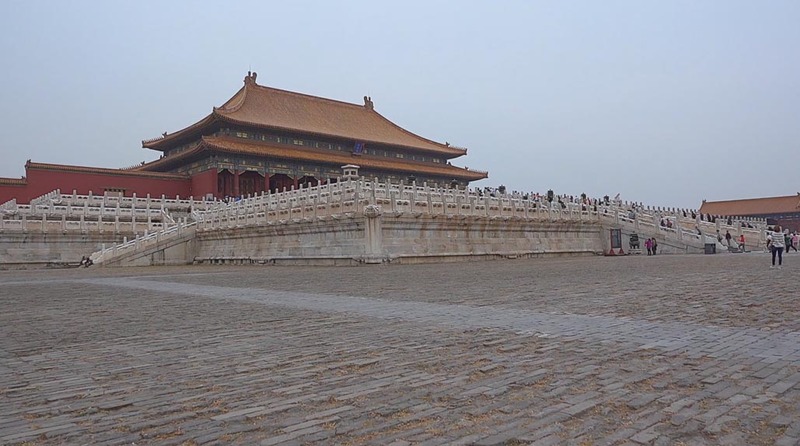 Forbidden City is the must visit attraction in Beijing. It is very large and it may take a whole day if you visit each hall one by one. I entered the palace at 9am and exit at amost 5pm in the afternoon. It was a tiring journey but i gained a lot. Excellent post summarising the sad history of those times. Power is still concentrated in the hands of a handful few. I wonder what the emperor did with all his concubines – how much can one possibly do…! PS: I like the HDRs! 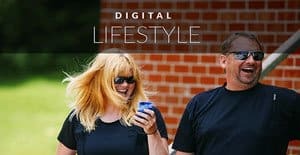 Thanks, I learned from this article! That Dui Xui Shan rock sculpture looks mind blowing! I’m hoping to visit China and Beijing this year! A wonderful selection of photos guys. I’ll make it there some day, it looks absolutely amazing. Wow, thanks for this history lesson! I never knew ANY of this! Like you, my knowledge of Chinese history is pretty much zero. 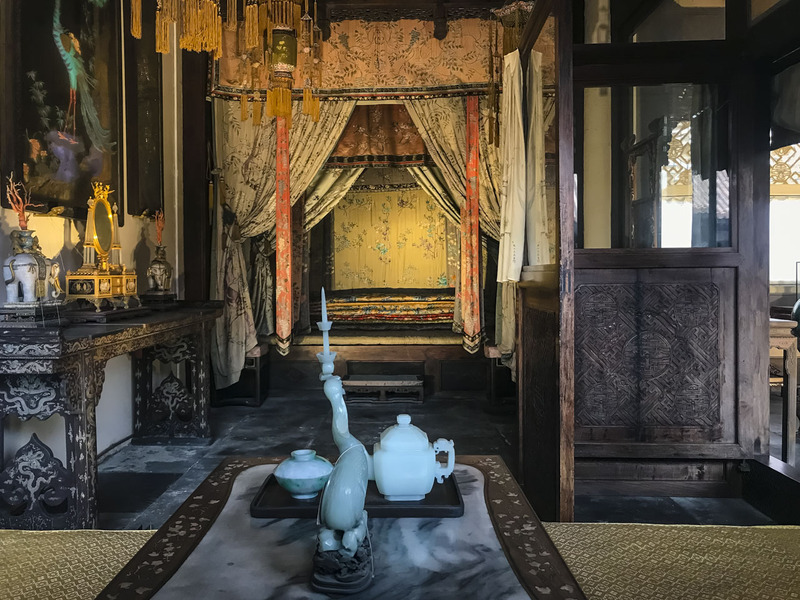 While the information was fascinating about the Emperor and the Forbidden City, I came away from this post with a different thought. Would I rather have power, wealth, and the favor of the Emperor or my freedom, family and friends, and manhood? I think I have to choose the latter because real life and joy can only be found in that. I have to believe the Eunuchs were very miserable people. These are beautiful pictures! I was just showing this to my fiance and we’re ashamed that we never even see half of the stuff you seen and he’s Chinese. We planned to go back visit his family and vowed that we should really explore the Chines history and culture even more. I love the trip you took. Often times I tried soooo hard to learn as much history as I can about a place. I’d feel guilty otherwise. I should just accept the fact that I’m just not a big fan of history. Like you, we love cliff notes and the gory, juicy highlights 🙂 And thanx to you, we know of them for this place when we visit it for ourselves on our RTW trip next year. Glad to hear we are not alone. I was pretty sure that people would give us a little flack for not being interested when visiting such an historic building. But we can’t change what we are interested in eh. 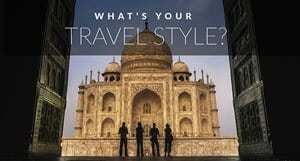 Looking forward to following your travels when you start your RTW. I’ve been there several times. It’s such a gigantic place. You feel like it’s never ending! What incredible pics, especially the 1st one. It is gigantic Andi. It would be cool to go several times as opposed to one very long visit. I think it would give a person time to absorb all the history and architecture. Thanks for the quick history lesson! I like the Cliffs Notes too, I had no idea what that the so many concubines were housed inside, par for the course at that time though regarding the forced imprisonment inside the city I guess… Thanks for the peek, I’d have left quickly too – you guys are awfully bundled! Yes, it was a chilly day and it seemed to get colder with each passing minute. Too bad we couldn’t leave quicker, but it was funny near the end. During one of the last buildings, our guide asked us if we would like to look around for 15 minutes. We all agreed that we would like to just have a quick look and move on.